War! Huuh! Good God y’all! What is it good for? FBI agent Jack Crawford (Jason Statham), and partner Tom Lone (John Lone), are tracking the elusive “Rogue” (Jet Li), a former CIA agent now working for the Japanese Yakuza in San Francisco. The two have located him, and Lone decides to execute him before he executes Crawford. Shockingly, Rogue has survived, and comes for Lone, and successfully kills he and his family. Now driven by vengeance, his partner Crawford has made it his mission to seek out and destroy Rogue, who is not to be found. He does resurface three years later, on a mysterious personal mission of his own that involves the Triads and Yakuza. One man wants justice, the other revenge. To obtain it, they will have to go through the warring factions, and of course each other. Just look at the poster at the top. 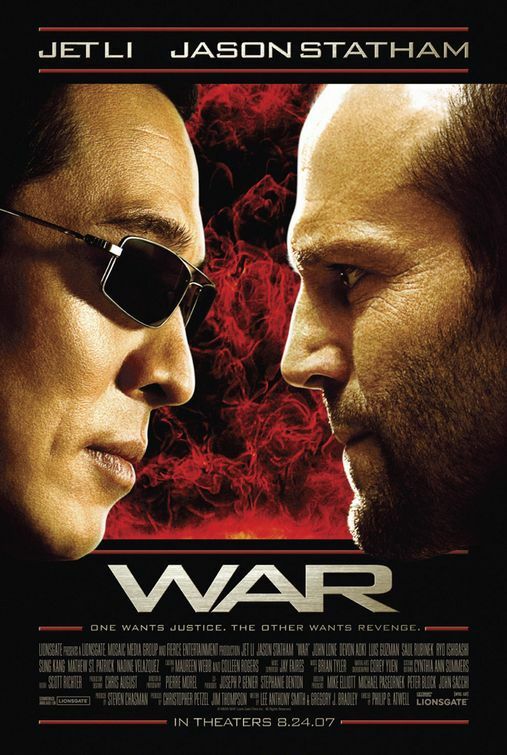 No, the red flaming background isn’t amazing, but with Jet Li and Jason Statham staring a hole into each other, it still effectively imprints a mental image of what one would expect to get when seeing War; that being impressive action, and the promise of seeing two modern action stars in their prime going mano a mano. The key word in that past sentence is expect. Sometimes, to expect and get something else delivered is a nice surprise, and other times the failure to deliver even the most basic of expectations can leave a bad taste in the mouth. The one and really only reason one would watch War is to see action, likely of the martial arts variety. It is a bummer on two fronts that the movie does not deliver either for the majority of the runtime. Honestly, about an hour goes by before a big-time action sequence is shown. From here, more action is introduced, thankfully, but little of it is anything to be remembered. Blame can be attributed to the director, Philip G. Atwell, to which War happens to be his first full-length feature (and to this point his only one). Much of the film’s action pieces are hastily cut, often obscuring what is going on. When you have Li and Statham at your disposal, this is a disservice to them. It isn’t a shock that it looks this way, as Atwell has made his name on being a music video director, but that doesn’t make it any less of a chore to keep up with who is hitting who. As time goes on, there is a feeling that Atwell wasted his leads. 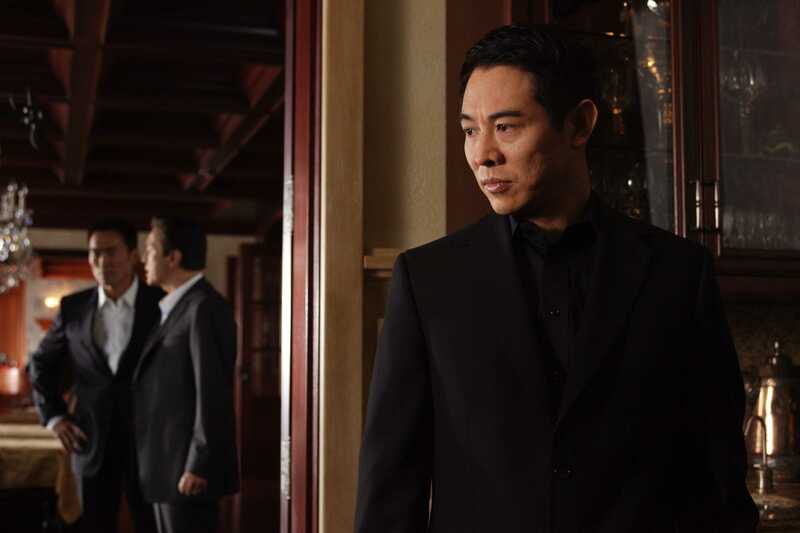 Instead of letting Jet Li do his thing as a martial artist, his character carries out his most of this business with a gun. If I wanted Shoot ‘Em Up I’d watch that. At least he does get more chances to look cool, unlike Statham. Until that sequence an hour in, Statham does relatively nothing but talk. Yours truly likes the guy, but he wouldn’t be my first choice for a role with heavy dialogue if equal moments of being an action hero don’t exist in the script. Unfortunately, with the lack of well-filmed action, the plot comes to the forefront. I didn’t say lack thereof, because there is one, but it just is not interesting, and kind of takes itself very seriously. Atwell and the writers try hard to build this Japanese lore through needless dialogue and flashbacks, but less couldn’t be cared about it. One positive that does exist within the plot is an unseen twist, that, with a little overlooking of one or two aspects of it, somewhat makes sense. The main issue with it, though, is that it comes right at the end which feels extremely rushed. Literally in the last two minutes of the movie, something happens, scene fades to black, new scene begins with no explanation of the last, and the movie ends with a minute-long zoom-out on a car. The merits of this War are few and far between with mostly incompetent action due to wonky editing and a tepid plot. Even the biggest Li and Statham fans are likely to be disappointed. Photo credits go to impawards.com, superiorpics.com, and latest-news15.com. I always wonder about this flick! I was a senior in HS when this came out and never got to watch. Always wondered about it too, but sadly it didn’t deliver on what I thought it would. Haha not at all! I just had that thought throughout when I was watching this for some reason. Ah, what a shame. The casting of Jet Li vs Jason Statham should sell itself! I hate when good actors/action stars are left high and dry with a nonsense movie. At least give us the goods we all expect!!! Thanks for reviewing this and helping me stay clear of another dud. No problem man! Every now and then expect these completely random ones out of nowhere. I know you do the same with past things too, nice way to diversify and take a break from the current fare. If you are interested, it is on Netflix now. Cool, I may take a peek sometime. Wow, thanks, I guess I can afford to miss this one! Sadly, the action really isn’t good enough to warrant a view imo. It’s been seven years and no need to revisit.